The Curious Wavefunction: A canard about Robert Oppenheimer in Louise Gilder's "The Age of Entanglement"
A canard about Robert Oppenheimer in Louise Gilder's "The Age of Entanglement"
It's always disappointing when an otherwise commendable effort at writing perpetuates hearsay about an important character in the story, especially when that hearsay is casually tossed out and left open-ended. 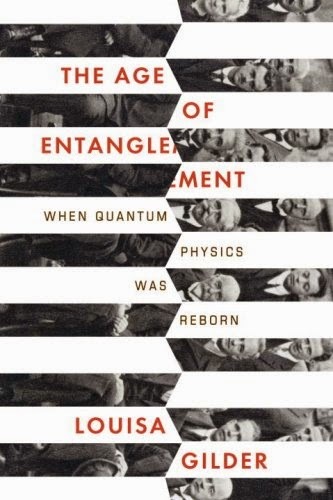 Louisa Gilder's book "The Age of Entanglement" is a rather unique and engrossing book which tells the story of quantum mechanics and especially the bizarre quantum phenomenon called entanglement through a unique device- recreations of conversations between famous physicists. Although Gilder does take considerable liberty in fictionalizing the conversations, they are based on real events. While some of the exchanges sound contrived, for the most part the device works and I certainly give the author points for effort - in fact I wish more popular books were penned in this format rather than simply pitched as straight explanatory volumes. Gilder is especially skilled at describing the fascinating experiments done by recent physicists which validated entanglement. This part is usually not found in other treatments of the history of physics. Having said that, the book is more a work of popular history than popular science, and I thought that Gilder should have taken more pains to clearly describe the science behind the spooky phenomena. Gilder's research seems quite exhaustive and well-referenced, which was why the following observation jumped out of the pages and bothered me even more. On pg. 189, Gilder describes a paragraph from a very controversial and largely discredited book by Jerrold and Leona Schecter. The book which created a furor extensively quotes a Soviet KGB agent named Pavel Sudoplatov who claimed that, among others, Niels Bohr, Enrico Fermi and Robert Oppenheimer were working for the Soviet Union and that Oppenheimer knew that Klaus Fuchs was a Soviet spy (who knew!). No evidence for these fantastic allegations has ever turned up. In spite of this, Gilder refers to the book and essentially quotes a Soviet handler named Merkulov who says that a KGB agent in California named Grigory Kheifets thought that Oppenheimer was willing to transmit secret information to the Soviets. Gilder says nothing more after this and moves on to a different topic. Now take a look at the footnotes on pg. 190-191 of Kai Bird and Martin Sherwin's authoritative biography of Oppenheimer ("American Prometheus"). Bird and Sherwin also quote exactly the same paragraph, but then emphatically add how there is not a shred of evidence to support what was said and how the whole thing was probably fabricated by Merkulov to save Kheifets's life (since Kheifets had otherwise turned up empty-handed on potential recruits). If you want to obtain even more authoritative information on this topic, I would recommend the recent book "Spies:The Rise and Fall of the KGB in America" by Haynes, Klehr and Vassiliev. The book has a detailed chapter which discusses the Merkulov and Kheifets letter procured by the Schecters and cited by Gilder. The chapter clearly says that absolutely no corroboration of the contents of this letter has been found in Kheifets's own testimony after he returned to the Soviet Union or in the Venona transcripts. You would think that material of such importance would at the very least be corroborated by Kheifets himself. A source as valuable as Oppenheimer would also most certainly be mentioned in other communications. But no such evidence exists. The authors also point out other multiple glaring inconsistencies and fabrications in the documents cited in the Schecter volume. The book quite clearly says that as of 2008, there is absolutely no ambiguity or the slightest hint that Oppenheimer was willing to transmit secrets to the Soviets; the authors emphatically end the chapter saying that the case is closed. What is troubling is that Gilder quotes the paragraph and simply ends it there, leaving the question of Oppenheimer's loyalty dangling and tantalizingly open-ended. She does not quote the clear conclusion drawn by Bird and Sherwin, Haynes, Klehr, Vassiliev and others that there is no evidence to support this insinuation. She also must surely be aware of several other general works on Oppenheimer and the Manhattan Project, none of which give any credence to such allegations. You would expect more from an otherwise meticulous author like Gilder. I have no idea why she entertains the canard about Oppenheimer. But in an interview with her which I saw she offers a possible explanation: she says that she was first fascinated by Oppenheimer (as most people were and still are) but was then repulsed by his treatment of his student David Bohm who dominates the second half of her book. Bohm was a great physicist and philosopher (his still-in-print textbook on quantum theory is unmatched for its logical and clear exposition), a dedicated left-wing thinker who was Oppenheimer's student at Berkeley in the 1930s. After the War, he was suspected of being a communist and stripped of his faculty position at Princeton which was then very much an establishment institution. After this unfortunate incident, Bohm lived a peripatetic life in Brazil and Israel before settling down at Birkbeck College in England. Oppenheimer essentially distanced himself from Bohm after the war, had no trouble detailing Bohm's left-wing associations to security agents and generally did not try to save Bohm from McCarthy's onslaught. This unseemly aspect of Robert Oppenheimer's personality was well-known; he was a complex and flawed character. But did Gilder's personal views of Oppenheimer in the context of Bohm taint her attitude toward him and cause her to casually toss out a tantalizing allegation which she must have known is not substantiated? I sure hope not. I think it would be great if Gilder would amend this material in a forthcoming edition of this otherwise interesting book. Without question, Oppenheimer was hounded by the FBI who tried to keep him under continual, at times continuous surveillance. When the family lived in St. John UIS Virgin Islands in the 50s and 60s at Gibney (known today again as Hawksnest) Beach, this could be rather difficult. Of particular concern to them was the family's friendship with Russian Tenor and defector Ivan Jadan and his wife Doris, a bit of which is recounted in American Prometheus. Perhaps they thought Ivan could be a 'conduit' through which secrets could be passed. No one who knew Ivan could ever suspect this, gentle guileless man that he was. Growing up in the islands I had the great privilege to know Ivan and Doris in their twilight years, and stories of the Oppenheimers and their government shadowers were of great amusement to Doris. She said, in the close-knit St. John community the poor operatives had little hope of true concealment. Try as they might they could not come off as touristy enough and would be spotted right away by locals. At times there were none for months on end, then around the time of the Cuban Missile Crisis there were suddenly two or more. One evening as the Jadans and Oppenheimers were dining together, a waitress smiled and nodded in the direction of two gentlemen a couple of tables away. One pretending to read a newspaper, the other a book. "Is good for them to be here," Ivan said. "it is a beautiful place." He sent a bottle of wine to the table and the one with the book made first eye contact long enough to raise his glass as for a toast. I wonder if that made it into the field report.